The largest sea, air and land military maneuvers ever conducted by Chile’s military near the country’s northern border with Bolivia and Peru between November 7 and November 13 have escalated tensions between these countries, pointing to a real threat of war. The national animosities date to the Pacific War fought in the 19th century (1879-1883), in which the victor, Chile, grabbed vast amounts of Peruvian and Bolivian territory. 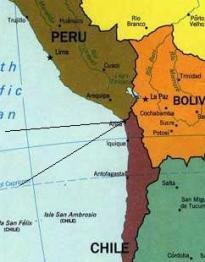 Bolivia effectively lost 400 kilometers of Pacific coastline, leaving it a landlocked nation. What makes the Chilean military exercise, codenamed “Huracan 2015”, more significant than those carried out in previous years is that it took place under conditions in which both Peru and Bolivia have won favorable rulings from the International Court of Justice (ICJ) at The Hague with respect to territorial disputes with Chile. In early February 2015, the International Court granted Peru control over 50,000 square kilometers of open ocean previously claimed by Chile as part of its national waters. Then in September, the ICJ declared its competence to deal with a demand by Bolivia, which claims the sovereign right to have access to the Pacific Ocean. Chile insists that in a treaty concluded in 1904, 20 years after the end of the Pacific War, Bolivia forfeited all claims to access to its former Pacific coast. The two countries have not had full diplomatic relations for decades, with the exception of a brief period in which both countries were ruled by fascist military dictators: Chile’s Augusto Pinochet and Bolivia’s Hugo Banzer. The decisions appear to concern small changes to long disputed border issues. However, they could have large, dangerous repercussions under conditions in which the ruling elites in all three countries are deliberately whipping up nationalist fervor to deflect growing social tensions generated by a severe economic deceleration due to lower metal prices and reduced exports to China. All three presidents face increasing popular discontent and are all accused of being involved in illegal activities. For “Huracan 2015”, the Chilean Armed Forces mobilized over 5,500 troops on Chile borders with Bolivia and Peru, in addition to deploying tanks, frigates, submarines and both combat and transport aircraft. At one point, President Bachelet attended the military exercises. While these exercises have taken place annually since 2000, with the exception of 2010 due to the huge earthquake that hit the Chilean coastline that year, last month’s were by far the largest and most menacing. On the eve of these military maneuvers, Chile denounced the Peruvian government for its formation of a new administrative district in the La Yarada-Los Palos area on the disputed border. The bone of contention is a tiny 10-acre wedge of land on the sea that both nations claim. Santiago recalled its ambassador when the Peruvian congress voted to form the new district in October, while Humala’s approval of the measure led Chile to cancel a planned bilateral ministers’ meeting that was to take place next month. The Chilean government also charged that Peru had sent troops into the area, which Lima denied. Adding to the growing hostility between the two countries, the Chilean Telecommunications Company aired a video mocking the Bolivian people and its president. “Huracan 2015” took place in the aftermath of an even larger UNITAS naval exercise in October. The annual UNITAS has been conducted by the Pentagon since 1959 as a show of force to further US hegemony in the region. It involves the militaries of a number of countries in the hemisphere. Phase one involved naval forces from 11 nations, including the US, Chile, Colombia, Ecuador, El Salvador, Guatemala, Mexico, New Zealand, Panama, South Africa and Australia. It began in Valparaiso, Chile on October13. Phase two was hosted by Brazil in the Atlantic Ocean and took place in November with nine participating countries: the US, Brazil, Cameroon, Chile, Guatemala, Honduras, Mexico, Peru and Senegal. The exclusion of Peru from the first part of the exercises, begun in Chilean waters, was indicative of the rising military tensions in the region. The extended sea, land and air military exercises are part of the global growth of militarism that has taken its most advanced form in the Middle East, with the US and its allies in the EU pushing to provoke a Third World War. The border conflicts between Chile, Peru and Bolivia intersect with mounting concerns in Washington over China’s economic penetration of South America and its increasing dominance in the extraction of the region’s strategic raw materials. These geopolitical tensions combined with the deepening crisis of bourgeois rule throughout the region raise the real danger that the continent’s Pacific coast could become a new arena of war.